Hi, Marisela! Can you tell us a little about yourself and what you’re all about? You have quite the knack for art! Being self-taught, did drawing Rabbids help develop your overall style? Or did you begin to tackle drawing the crazy critters once you arrived at your current style? Yes actually! I have been drawing Rabbids for as long as I could remember, but my sudden drastic change in art style was thanks to looking at the various and quirky styles of concept art relating to Rabbids from their numerous games. Another reason is because of my best friend whom I met because of your amazing game! He and I, for the past year, are always sharing our love for Rabbids through our drawings practically everyday! For years, and especially last year, I started to feel more confident and happier about my art once I learned how to draw in different styles rather than just one. That’s all thanks to the Rabbids Community Team, and my best friend! It’s never a bore drawing those silly, lovable cretins! When did you get your first look at the Rabbids? It was around a birthday or Christmas of 2006 when my uncle gifted me the ever nostalgic game of Rayman Raving Rabbids. Where it all began! 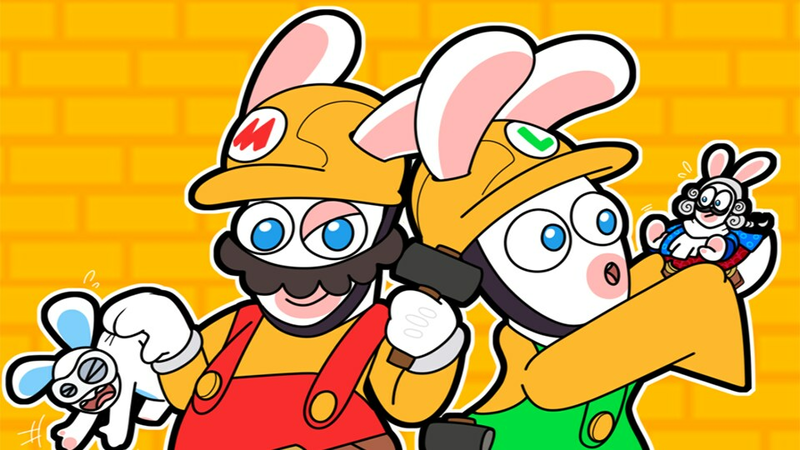 To be honest I was first a bit intimidated by the Rabbids at first… Over time however, and various replays of the game, their quirky and crazy little selves invaded my heart and made me ever so soft over them. I adore them, needless to say, and to this day my love for them just keeps growing and growing. They’ve made me quite the enthusiast towards them if I may say! 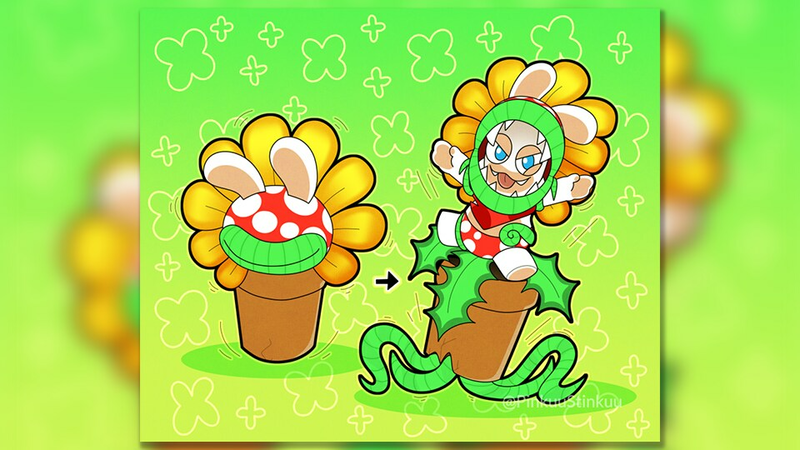 I always love looking at various concept art, history, backstory, merchandise, their graphic novels, including their show Rabbids Invasion which I deeply adore, you name it! If it’s anything to do with the Rabbids, very high chances say I’ll love it! I’m always on top of the most recent news if it’s related to Rabbids! Sometimes my friends come to me if I know something new has come up for those fluffy critters! I’m pretty much known as a huge Rabbid nerd to my friends, and I’m proud of it! Rabbids since knowing them have made my life better in a positive way. If I need to unwind or when I’m feeling nostalgic, I like to replay all their current games that have been released so far. (Not to brag or anything, but I have collected and bought all of their games so far out of love and dedication!) It just makes me so happy seeing them. J’aime les lapin crétins! 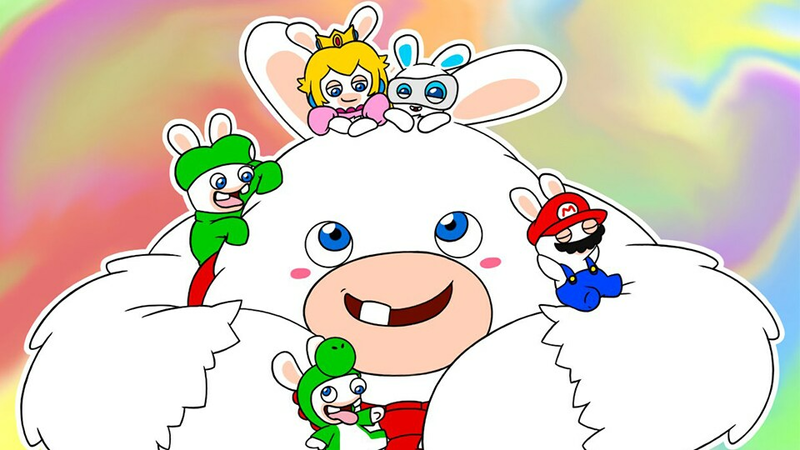 So, when Mario + Rabbids: Kingdom Battle appeared, what drew you to the game itself? Other than that very sweet, touching and iconic moment with Davide Soliani, (Don’t worry I cried too when you did!) 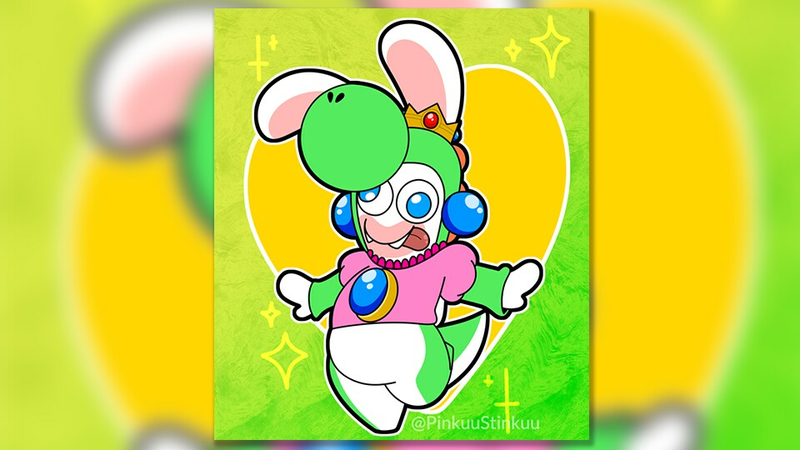 the fact that the Mario universe and Rabbids’ universe combined into something so unimaginable, so unthinkable but yet so perfect, was just amazing to me. And for many others think I can say the same for them when I say how remarkable it all turned out. It was way better than my expectations. I love every single bit of the game of it entirely. The music that sticks to your mind made by the wonderful Grant Kirkhope, the vibrant and beautiful scenery and its worlds, the small things such as those quirky Rabbid sequences that happen in the background while you are strolling along through the game, I could ramble on forever on how much I love this game, but the main reason that the game has captivated me, was how new and interesting the game and the game genre was to me! I always find something new when playing! 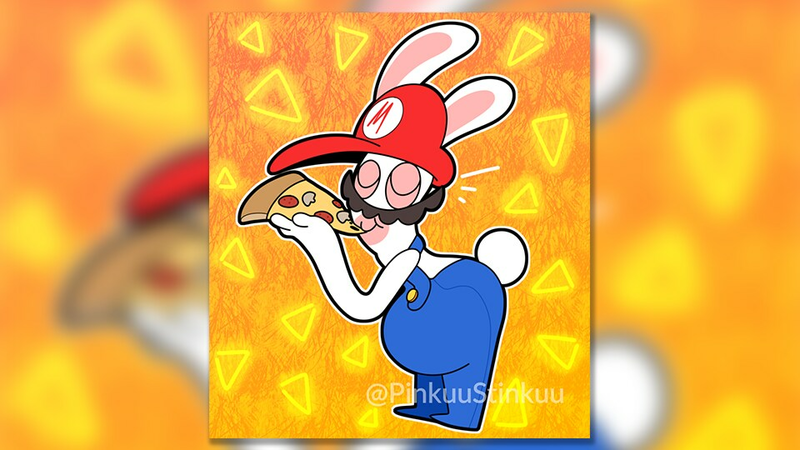 We love the use of vibrant colours in your art, it especially lends itself to the bright universe of Mario + Rabbids. Do you prefer to work with more vibrant palettes? As you developed your own style by yourself, do you have any advice for artists in the Rabbids community who want to better show their uniqueness through their art? My advice would be to try something new, something crazy, something you’ve never done before and keep at it! Drawing in just a single style is great, but just like learning new languages or anything in that matter, the more ways and forms you know how to do something, the more it’ll benefit you! Don’t be afraid to stray from a single style to another is what I’m trying to say. Things to help you if you have an itch to change it up a bit is to get inspired basically! Look at your favorite shows, artists, references, or even your friends drawings if they are artists themselves! Use those as examples and then merge those examples together to create a style you can call your own. Don’t afraid to look at examples either, everyone needs them, that’s what they’re there for, to help you, to inspire you, and hopefully, to give you motivation. Where can we find more of your art? Where do you display your works? Once again, I’d love to give my infinite thanks to everyone at the Rabbids Community Team for giving your time for this memorable opportunity for me. I shall cherish it forever deeply. You all genuinely seem so kind and open whenever I see you reaching out and conversing to the community and your fans. 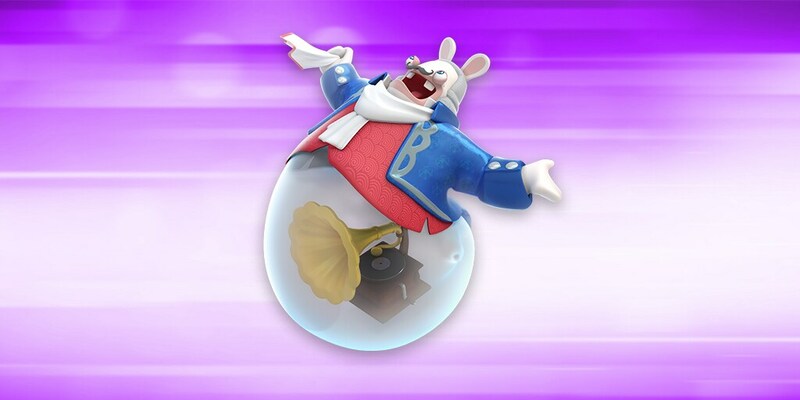 I will continue to show my dedication for the foreseeable future the Rabbids will encounter and face in whatever new, and as always quirky adventures they will face in future games. God bless!